Gibney Dance Company returned to Rwanda in December 2017 to collaborate once again with Itorero Amahoro, a dance cooperative in Gisenyi, Rwanda, followed by a performance of contemporary work at the East African Nights of Tolerance Festival (EANT) in Kigali. Supported by a grant from the Mid Atlantic Arts foundation, this Global Community Action Residency unites the many facets of Gibney on an international stage: community, entrepreneurship, teaching and performance. Our Director of Community Action and Artist Services Kara Gilmour, along with Company Co-Directors Amy Miller and Nigel Campbell first worked with Itorero Amahoro in December 2016 in partnership with the Director Jill Sonke of the University of Florida’s School of Art in Medicine, UF Dance Faculty, and staff from Dance for PD affiliated with Mark Morris. Our group of professionals worked alongside an indigenous community of dancers, exchanging artistic practices and offering support around issues related to performance and entrepreneurship. In addition to working together artistically during both residencies, we also convened with the cooperative’s leadership council to discuss best practices around business, marketing and sustainability. Our objective in these efforts is to increase awareness of the cooperative within the Rwandan community and to help share locally, the power their art has had globally. During the residency in 2016, Company Co-Director Nigel uploaded a video of a rehearsal that has caused a viral internet sensation, garnering over 3.6 million collective views from multiple sites and inspiring thousands of comments from more than ten countries. The social media reactions revealed that audiences around the world found the dances of the Itorero Amahoro to be uplifting, stirring and beautiful, and thought that they communicated solidarity and cultural identity. The University of Florida created a vinyl poster for the cooperative with these statistics that now hangs proudly in their home base at Pottery Rugerero. 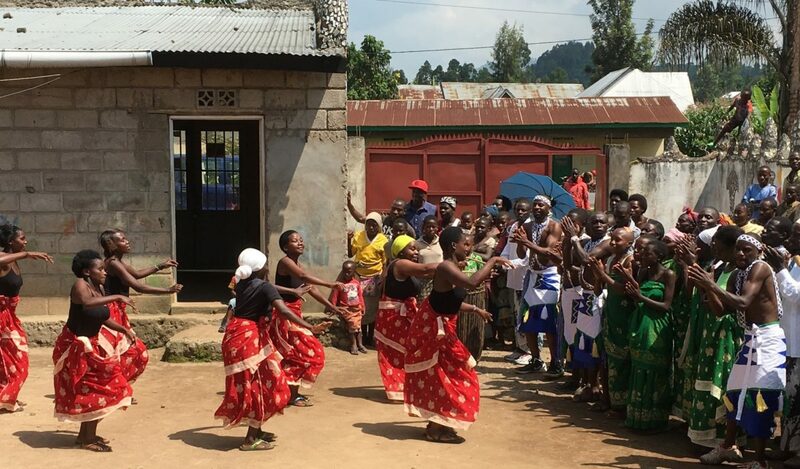 In December 2017, Gibney supported the Itorero Amahoro dancers as they prepared for a public showing of their traditional Rwandan dances that had been reimagined with an eye towards public performance. This event was attended by many notable advocates, governmental organizations including the Rwandan Development Board, along with local television and radio crews generating more visibility and employment opportunities for these incredible emerging artists. Co-Directors Nigel Campbell and Amy Miller performing a section of their violence prevention assembly ‘Hands are for Holding’ with the support of the village. On Saturday the Itorero Amahoro Dance Cooperative (Troupe of Peace) in collaboration with Gibney Dance Company and the University of Florida department of Arts in Medicine presented its traditional dances to Rwandan Media (TV and radio), Government Officials, & Tourism Representatives… The culmination of 2 weeks of concentrated work, years of investment and cultural exchange, and centuries of tradition and heritage. Rwanda’s Historically “invisible” people were SEEN. “Those who have been left behind by history” are coming to the forefront … I could not be more proud to play some small role in this moment… And I am happy to say this was not just a feel good mission. The troupe was BOOKED! Bookings will provide much needed resources for their community and elevate their standard of living. Dance did that. 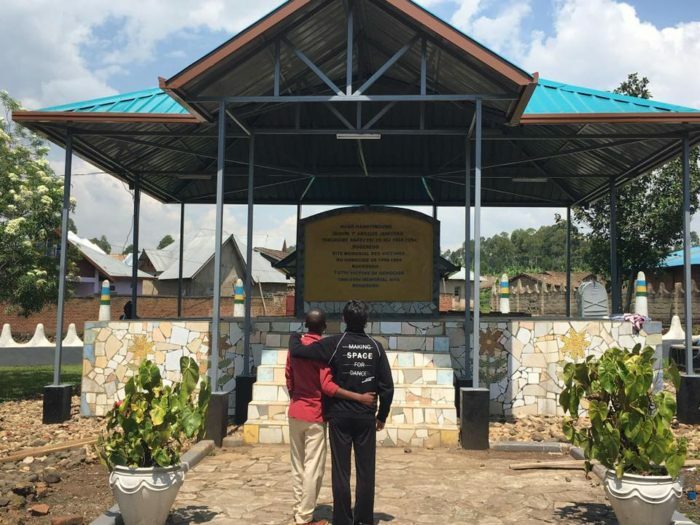 Genocide Memorial Park – Rugerero Survivors Village, Gisenyi – Created by the Barefoot Artists with Lily Yeh, 2004. Gibney Dance Company was thrilled to have had the opportunity to continue to invest in our relationships in East Africa through participating in this 2017 EANT Festival as well. 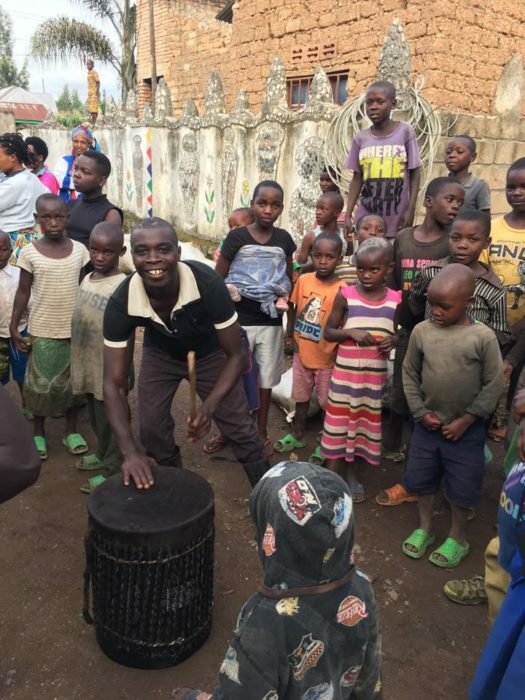 Co-Directors, Amy Miller and Nigel Campbell, traveled to the capital, Kigali, to perform selections from Gina Gibney’s Folding In performing alongside artists from Rwanda, Uganda, Kenya, Democratic Republic of Congo, Cameroon, Togo, Belgium, France and Spain. 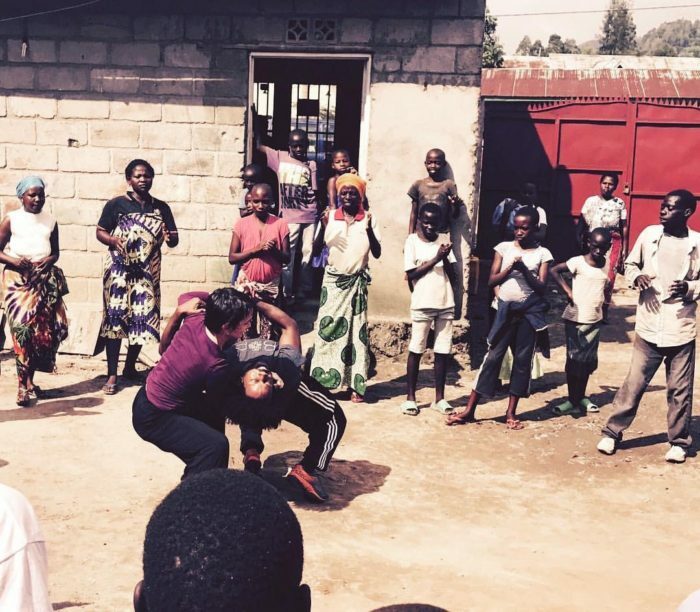 They also taught a master class and creative process workshop for 26 young dancers from Rwanda and the Democratic Republic of Congo which prioritized both physical rigor and social-emotional skill building. Reconnecting with artists we met last year at the Rwandan Arts Initiative and engaging in cross-cultural dialogue throughout the festival was hugely impactful. Through a group discussion at the Goethe Institute, which brought together over 30 artists from around Africa and Europe, our conversation brought to life a myriad of similarities and differences in the struggles of artists around the globe. Dedicated to generating dialogue around the issue of women in the arts, this event served to reinforce the need to name the various gender norms inherent in our cultures and pinpoint barriers toward equitable practices and positive forward movement. Gibney Dance Company’s involvement in the East African Nights of Tolerance Festival in Kigali, Rwanda has offered professional development opportunities for our organization to expand both artistically and strategically. We were able to connect with representatives from the Dar es Salaam’s MUDA Africa and their Time 2 Dance Festival confirming our invitation to next year’s festival in the Tanzanian city. MUDA’s fantastic advocates for the arts field, executive director Rachel Kessi, along with artistic director Ian Mwaisunga, have created an incredible platform for arts learning and community-building in Dar and we reveled in this time to connect during the EANT Festival in Kigali this year. We’ve already begun our fundraising efforts to return to Dar es Salaam next fall. Coming full circle, we were able to bring the leadership team from the Iterero Amahoro Dance Cooperative in Gisenyi to the EANT Festival in Kigali to meet with Director Wesley Ruzibiza as well as attend Gibney Dance Company’s performance. We hope that this emerging dance troupe might be considered to take part in the EANT Festival next year and were very excited to introduce them to the festival organizers and deepen the connections. 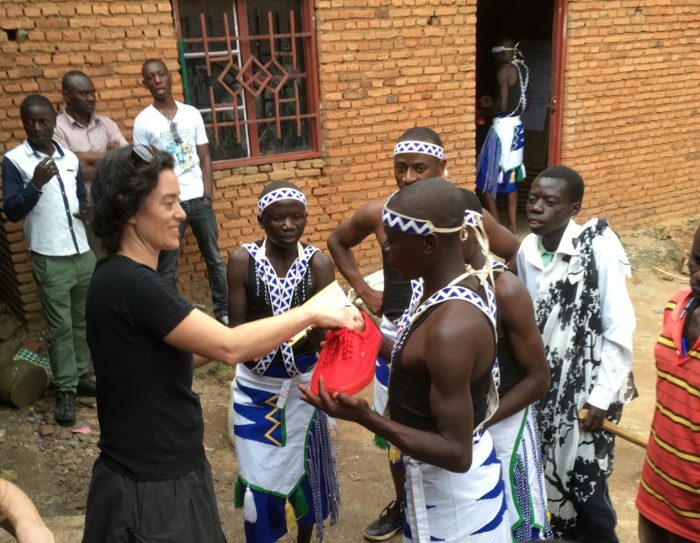 Senior Director of Community Action, Kara Gilmour sharing new shoes with Itorero Amahoro dancers.